This picture book opens with the Franks fleeing to the annex. Then the author tells about happier times, the coming of the soldiers, and the beginning of the persecution. 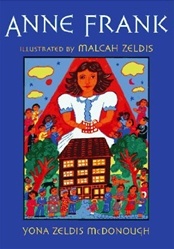 Sophisticated language, topic, and the many flashbacks preclude the book's use with young children. The explanation of Hitler's accession to power is simplistic; McDonough attributes it solely to bad economic conditions. Once the author is into Anne's story, however, she tells it in a straightforward manner and relates it well. 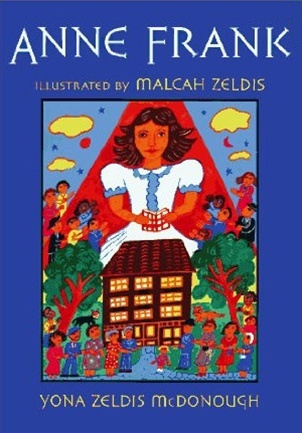 The book is illustrated with bright, folk-art paintings. At first, the pure colors of yellow, red, orange, green, blue, black, and brown surrounded by alternating borders of the same colors seem inappropriate for such a subject, but the childlike images provide impetus for discussion, and the bright colors of the innocent contrast well with the dark colors of the evildoers. The paintings of happier past times are cozy and cheerful. Mama and baby Anne look like a 1930s version of the Madonna and child. A small painting of barbed wire encircling crossed Nazi flags on the opposite page foreshadows the trouble to come. McDonough tells the story, but there's no doubt that Zeldis provides the emotion. In the final picture, Anne is seen towering over the world and all its people. She has risen phoenixlike from her diary and has become a myth, a myth that symbolizes the yearnings of a people to be brave, to be optimistic, and most of all to survive. Anne did not survive, but her story lives on.